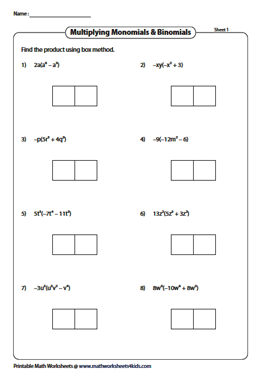 Incorporate this interesting set of worksheets to multiply polynomials using the box method. Visualize the steps involved in the multiplication of polynomials using grids whose size depends on the type of the polynomials being multiplied. Intensify your practice by multiplying monomials by binomials, two binomials, binomials by trinomials, two trinomials, binomials by polynomials using the box method. 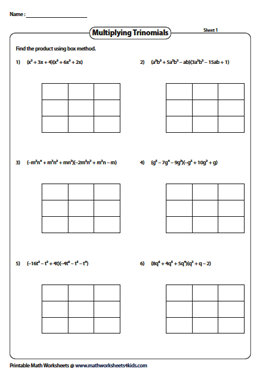 This set of multiplying monomials worksheets encompasses 1x2 grids to multiply monomials by binomials. Multiply the monomial with each term of the binomial, fill in the boxes and group the like terms. 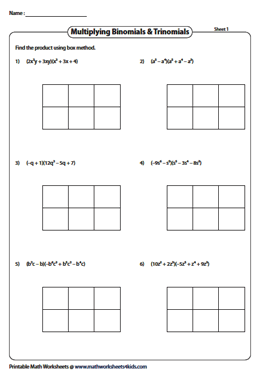 Organizing binomials into boxes facilitates easy multiplication. Included here are two-by-two boxes to multiply binomials. 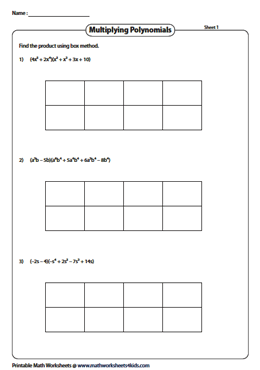 Each worksheet features six unique polynomial multiplication exercises comprising 2x3 grids. Multiply each term of the binomial by individual terms of the trinomial to obtain the product. 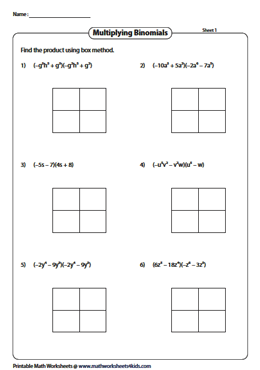 Employ the worksheets with 3x3 boxes to multiply trinomials. Multiply the terms in the rows with those in the columns to determine the products in these multiplying trinomials using box method PDFs. The box method serves as the best alternate to the usual multiplication, as the process is broken down into simple steps. Utilize the 2x4 boxes to multiply binomials and polynomials.